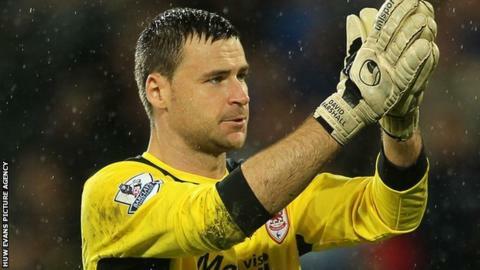 Cardiff City: David Marshall says top six is a minimum target. Goalkeeper David Marshall says Cardiff City will be aiming for a top six finish as a minimum in the new season. The Bluebirds were 11th in the Championship last term after relegation from the Premier League in 2013-14. The 30-year-old Scotland international argues that the club is better equipped mentally ahead of the new season. "It's probably more realistic in terms of expectations this year, so we'll probably be able to handle that a bit better," he said. "I think probably for 18 teams the top six is a realistic target because there's so many upsets in the league and there's not a lot to choose between the teams, but we'll be aiming for the top six as an absolute minimum." Cardiff were among the favourites for promotion ahead of the 2014/15 campaign, which Marshall claims was an unrealistic expectation. "Most teams coming down from the Premiership are labelled as favourites to go back up," he said. "We were realistic as a team and set of players and staff last year but obviously the expectations for the fans and the media are a little different". Cardiff manager Russell Slade has been forced to cut expenditure over the last year, but Marshall thinks this should not stand in the way of a promotion chase. "Obviously expectations have dropped in the last 12 months, but I'm sure if we work hard and have a good start we can certainly aim for the top six," he added. Cardiff start their campaign at home to Fulham on Saturday, 8 August.